Janet Jackson stepped out from her diamond-laden, gold-dipped (I assume ... ) mansion with her husband Arab businessman Wissam Al Mana over the weekend. 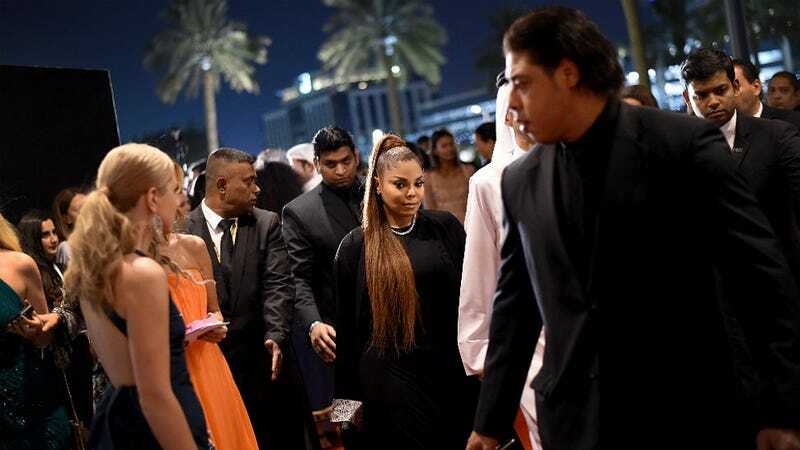 Paparazzi made sure they were at the Vogue Fashion Dubai Experience to catch the real elusive chanteuse in action, since she's hasn't been seen publicly since 2013's AmFar Gala. Here's the thing about Mrs. Jackson; as the sister of the King of Pop Michael Jackson and a member of one of America's royal families — for better or worse — she's a master at old school publicity tricks. In 2012, the woman got married in secret and the rabid 24-hour news cycle press didn't find out about her union with until February the following year. In a time where we know too much about all of our celebrities, it's almost refreshing to catch a peek of Janet and her not-so-new husband when she allows us. Granted, she's not the hottest star in the galaxy these days, but I admire her ability to sit down unlike some other stars who can't seem to figure out how to do the same. Take notes, people.